Today’s Lindt reviews are the rest of the free samples that I received from their PR peeps. Other new Lindt bars were covered on Monday. 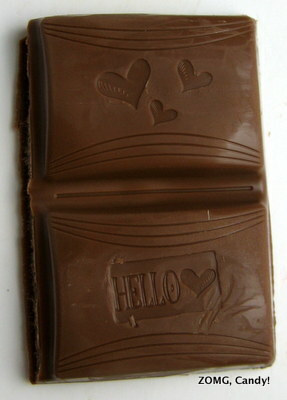 These Lindt “Hello” bars are new limited editions that are exclusive to Target. 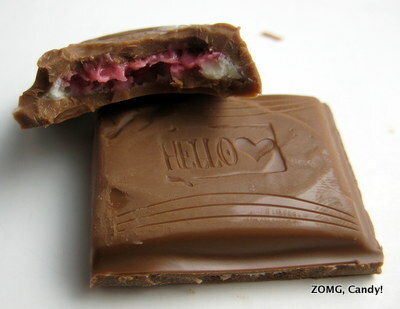 Unlike the Excellence bars, which are solid chocolate, the Hello bars are softer pods of filled chocolate. Mine arrived a hair squished in the summer heat. Chocolate Sundae describes itself as “milk chocolate with vanilla and chocolate fillings and almond pieces.” The milk chocolate shell was soft, with a thick and creamy melt. 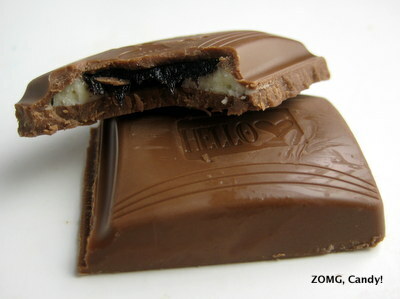 The black and white filling was soft and oozy. The chocolate syrup had a deeply fudgy flavor that reminded me of chocolate pudding. Though the vanilla cream was visible, its flavors got lost in the chocolate, as did the almond. My boyfriend enjoyed this, but it was too sweet for my taste. The interestingly-named Pink Explosion looked to be trying a bit too hard with its packaging. “I’ll Pop. You Lock!” What does that even mean? It was “milk chocolate with popping raspberry and cream filling”. So the moniker of Pink comes from the raspberry, and Explosion comes from pop rocks-esque candy bits. Quite unlike other pink things that, um, explode. The pink filling was extremely sweet and brightly fruity, with a hint of raspberry seediness (and some actual raspberry seeds!). It tasted of raspberry jam, while the popping candy sparkled in my mouth. These were fun to eat, but too sweet for me, so I wouldn’t buy them myself. An O.